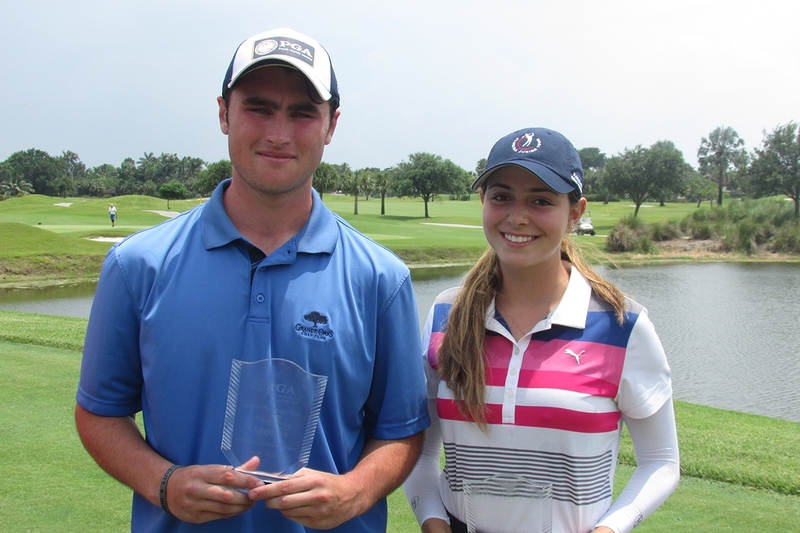 July 26th 2018 - ATLANTIS, Fla. – This week, the South Florida PGA Junior Challenge Tour presented by The Honda Classic held Challenge Tour Event #7 at Plantation Preserve Golf Course & Club. The challenging course provided a great tournament for all juniors. Chase Caterbone of Plantation, FL captured his first SFPGA Challenge Tour victory this week. Caterbone fired an opening round 74 and followed it up with a 1-under par 71 today to capture the boys’ division by one stroke over 3 other players. NaShawn Tyson of North Palm Beach, FL took home the boys’ 13-15 age division, while Leif Sinclair Stuart, FL too home the boys’16-18 age division. Ana Maria Lopez of Weston, FL captured her first SFPGA Challenge Tour victory this week as well. Lopez fired rounds of 76-76 to take home the girls’ division by three strokes. Katherine Schaefer of Southwest Ranches, FL took home the girls’ 13-15 age division, while Makenna Brown of Boca Raton, FL took home the girls’ 16-18 age division. Carson Baez of Palmetto Bay, FL took home the boys’ 11-12 age division after rounds of 78-70. Baez’s round featured an eagle on the par-4 13th hole during his round. Logan Stachkunas of Lake Worth, FL finished in second place in the boys’ 11-12 age division.